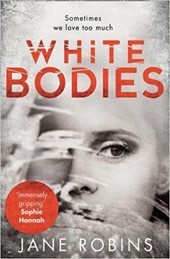 White Bodies is a taut psychological thriller from a writer of non-fiction. It is centered on twins Callie and Tilda. The story illustrates Callie’s obsessive love for her emotionally fragile (actress) sister which is magnified when Tilda marries Felix whose behavior towards Tilda seems highly controlling. I have read and enjoyed the non-fiction books of Jane Robins in the past, so I opened this novel with great anticipation for her first novel. I was not disappointed by the quality of her fiction-writing as she excels in creating highly successful character delineations, coupled to penning a dark and disturbing tale. Callie worries about her sister’s wellbeing at the hands of a man with compulsive habits and a potential for violence. Callie is the less successful sister who has been overshadowed all her life by Tilda. Her memories of their years growing up indicate the enormous weight of Tilda’s existence squeezing individuality from Callie. Callie behaves like a younger sibling during their childhood and the reminder that she is a twin quite surprised me. Callie and Tilda are unalike, with Tilda the golden one and Callie the dark one. Their mother seems rather a cipher apparently unaware of their destructive ways of behaving. Callie has some very weird habits, indeed. Not surprisingly the adult Callie lacks confidence so she has a nondescript job, fails to dress to show off her assets, and only seems to find a boyfriend part-way through the book. When she fears that Tilda is being menaced by Felix, Callie starts to investigate abuse against women on the internet and embroils herself with contacts from a particular website. Throughout it is hard to know what to trust since Callie is obsessed and Tilda seems an unreliable witness. The story spirals into deeper and darker waters as it progresses. The conclusion is shocking and it certainly ties up all the loose ends of the story effectively. Though I found the two main characters fairly unappealing and psychologically depressing. Tilda is emotionally and physically damaged and totally self-absorbed; Callie allows Tilda to dominate her, leaching all the colour out of her and then becomes a stalker of her own sister. With these two, protagonists, I found I couldn’t empathise with either of them so I didn’t engage fully with the story.